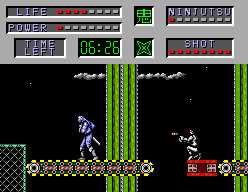 The Cyber Shinobi is an action game that's exclusive to the Sega Master System. Playing as Joe Musashi, your job is to travel through six rounds and stop Cyber Zeed's army from stealing plutonium in an attempt to melt the planet. Your main weapon is a Sword, but long-range projectiles (e.g. Shurikens) and Ninjutsu attacks can be activated by collecting icons. The gameplay is littered with shoddy programming, as the controls are stiff and button presses can be delayed or ignored. The collision detection is off, and you can even glitch into an enemy sprite and continue to take damage until you lose a life! Similarly, the scrolling is jerky and resembles an Amstrad CPC game rather than a cutting-edge SMS title. The need to completely clear an area of enemies before the screen will scroll is arduous (and hides how small each stage is), but it wouldn't be so much of an issue if the enemies were remotely intelligent; they'll happily walk straight into your attacks, leaving you to button-mash your way through each stage. Likewise, enemy A.I. is dumb, as they'll often face the opposite direction, despite you pounding on one of their fellow soldiers behind them. The gameplay does have some good ideas though and provides you with lots of ways to defeat enemies through close quarters combat, long-range attacks and Ninjutsu. As a whole, the level design is lacking in memorable scenes, but there are some elements I like, such as the intense beginning of Stage 3 which throws you straight into the line of fire as a helicopter rains down rockets. However, Stage 5 is pathetic, as the entire level consists of you falling down a long waterfall, collecting power-ups with no enemies in sight! Conceptually, The Cyber Shinobi is terrific, but it's execution in the gameplay department leaves a heck of a lot to be desired. It's clear that this was a rush release by Sega as it's full of technical issues that plague the entire experience, and force it to dip below the series' lofty expectations. Random trivia: The next game in the series was Shadow Dancer: The Secret of Shinobi, which was released on the Sega Master System in 1991.